How to delete a survey? 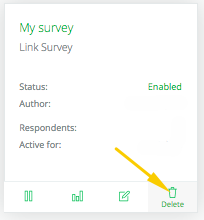 To delete a survey, click on the bin icon located in the right- bottom corner of your survey. You can also do it from the view of the specific survey by clicking on the bin icon in the right top corner.